Rickie Fowler needed 67 starts to pick up his first victory on the PGA Tour, which came earlier this month at the Wells Fargo Championship. His good form followed him to the The Players Championship this weekend, where he finished in a four-way tie for second place and just three strokes short of claiming what is considered to be the “fifth major”. 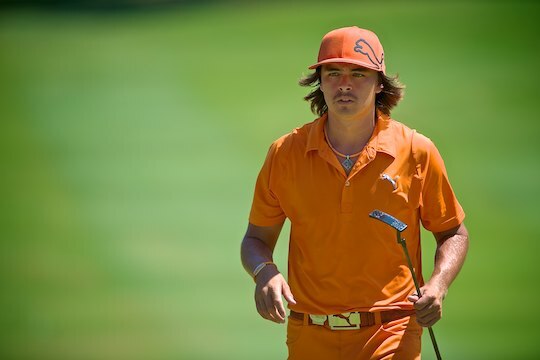 For the past three years, Rickie Fowler had presented himself on Sundays in his trademark Oklahoma State orange from head to toe, drawing as much attention for his attire, as his play. For all of his flamboyance, Fowler knew that until he won his first PGA Tour title, he would always be considered as a young hopeful with a great game. Soon after he left Oklahoma State early to join the PGA Tour for his first full season in 2010, young fans began popping up in galleries wearing his boldly coloured Puma hats, complete with flat brims, propelling their new prodigy towards his first Tour victory. Until the play-off at the Wells Fargo though, Fowler, 23, had worked his way into contention several times on the PGA Tour but had yet to be able to close. Barely two months into his professional career, Fowler had already banked over US$500,000 in prize money. At the time the 20-year-old Fowler came to life at the Justin Timberlake Shriners Open firing four rounds in the 60’s to finish in a tie for 7th. The following tournament at the Frys.com Open in Scottsdale, Arizona, Fowler again turned heads after losing to Troy Matteson in a three-way playoff. In just two PGA Tour events the former world number one amateur, playing on sponsor’s exemptions, had cemented his status on the world’s biggest tour without going to Q-School. The only players since 1980 to earn their way onto the PGA Tour without needing to qualify are Justin Leonard, Gary Hallberg, Tiger Woods, Ryan Moore and Charles Howell III. Last October, Fowler won his first professional golf title with a six-stroke victory over US Open champion Rory McIlroy in the Korea Open on the OneAsia circuit. It was an important win at the time, yet it wasn’t a PGA Tour win – a win Fowler knew he needed to bag quickly to confirm his standing on the world golfing stage. “I’m happy with the way that I have played on the PGA Tour, but I have never shot low enough to win until the week at the Wells Fargo,” said Fowler following his PGA Tour win. Fowler is already well established in the world’s top-25 and has earned more than US$7 million in his three seasons on the PGA Tour. Fowler’s unique style, openness with fans and, of course, his immense talent, have quickly made him one of the PGA Tour’s most bankable stars along with Rory Mcllroy and Bubba Watson. Fowler and McIlroy are considered the likely heirs to the Mickelson-Woods legacy. They first met as members of opposite teams at the 2007 Walker Cup — the Ryder Cup for amateurs. “We’ve always had a great camaraderie, been good buddies,” says Fowler about McIIroy. Fowler was the number one ranked US college and amateur golfer when he made the transition to the professional ranks after heading up the US Walker Cup team’s win in 2009. At the 2008 Eisenhower Trophy in Adelaide individual honours for the lowest four rounds fell Fowler’s way. His obvious talent, coupled with his cool looks, attracted early endorsement deals with Puma and Titleist, who have stood by him during his formative years on tour. “Obviously I have some great sponsors and a good partnership with Puma,” says Fowler. Fowler is certainly a trigger point for the youth movement in the game. He continues to play golf just like he always has – aggressive, passionate and brilliant. The fans love it, as does the sporting world. “I know it is going to be tough as there are so many great players out there,” says Fowler. The Tour is only too happy to have Fowler succeed. If the 23-year-old can put it all together at a major, watch for an explosion equivalent to when Tiger took the golfing world by storm a decade ago. There’s no question that Fowler brings game. He is gifted, charming, engaging and fiercely competitive – traits that will serve him well as he continues to carve out his own niche on the world golfing stage.